Have you ever enjoyed the limbo with your kids or your classroom? It’s great fun and can be adapted to almost any age, grade or ability level. If you’ve seen movies about Trinidad or Tobago or the other beautiful islands in the Caribbean you’ve probably watched a crowd of people trying to bend under the limbo pole. Music is playing and everyone forms a line that circles around to dip under the stick and find out… “how low can you go?”. Sadly, the history of the limbo is not a pleasant one. The limbo was brought to Caribbean islands with slaves from Africa. The slaves were held separately – with men and women in different areas of the ship. In order to get over to see each another, the slaves needed to cross under very low spaces. Originally the limbo was done as a solemn and slow dance or ritual, sometimes as part of wakes or funerals. However, sometime after the 1950’s and 1960’s, calypso music became very popular and the limbo became better known as a dance done with colorful clothing and upbeat, happy music. That happier, more joyous limbo celebration became the dance that has made it’s way all around the globe. If you’d like to try the limbo, the dance is easy and fun and can be used in classrooms, summer camps, backyards, on the beach or in any party setting. Since the limbo pole was originally a broom, you can use an extra broom pole, a bamboo stick or any other long pole that is available. The official rules are fairly strict. Dancers must lean back to go underneath the pole. They may not touch the pole or touch the ground. However, when playing at a party or with children, feel free to create the rules that work best to suit the players abilities and that keep the dance a fun activity for all. What music can you play? You can find any great music with an island beat to accompany the limbo. There are some wonderful traditional and popular limbo songs you can explore. If you’d like to learn more about the early days of this dance, a record company called Putumayo has created a cd of original recordings from the early days of calypso music. Most folks in the United States recognize a song by Chubby Checker called the Limbo Rock and you can play that song as a Youtube video. I’ve written a song called “Do The Limbo” that is great for playing with children and perfect for learning English. I’ve used the tune of a popular Caribbean song called “Tingalayo” and added verses about the dance. I wrote this song while singing for a group of school children who did not want to stop dancing. So I created the new song on the spot about what was going on – they were dancing fast and slow, going left and right, and I kept adding simple verses so they could just keep having fun with the song and the game. I hope you have as much fun as they did with my own limbo song, or the limbo video below or some of the other great musical traditions from this beautiful part of the world. Look out now, we’re out of sight! We do the limbo – We do the limbo til we stop – cha, cha, cha! 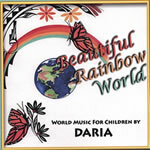 Do the Limbo song is available on Daria's Beautiful Rainbow World. Also available as a free video Do the Limbo from FreeSongsForKids.com. Please click here to view all of Daria's music on Songs For Teaching.